My friend and colleague Rashida and I are heading into Carrizo Plain National Monument in southern California for a field class on the largest remaining segment of valley grasslands in the US. We drive alongside a riverbed where water once filled the ten-foot wide channel. Now dust-covered shrubs and trees fill the canal. As dusk turns to darkness our headlights scare up owl after jackrabbit again and again. A barn owl flies silently over the road like a moving patch of snow; several brown owls dart after small mammals. Given their size and color they are probably great horned owls but they are too swift for us to detect their faces. 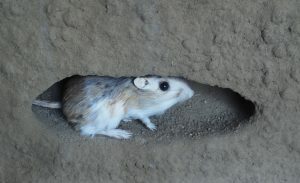 At least one giant kangaroo rat bounds out of the fields. I don’t know how many feasts were had or predators satisfied that night but it was clear we are staying in a wildlife refuge. We reach camp near a hilltop about 9 pm and are seized by cold. No time to make a hot meal. Our frozen fingers can only last as long as it takes to set up our tents — and however long that is — is way too long. But the cold jerks me out of my fatigue and I look up to see the Big Dipper and a million other stars. Having left the nearest city at least an hour before I am grateful to witness this celestial display. Back home it is always subdued by lights in my own urban habitat. I awaken at sunrise to the loud song of a loggerhead shrike perching on a short tree adjacent to my tent. I get up and look around and vast grasslands and billowing balls of cotton dominate the landscape. An invisible force changes the sky constantly. Clouds coalesce or disintegrate depending on the weather. It is these two elements, the plains and the clouds, that will make up my vision of the monument for the next two days. Once we get down into the plains the clouds appear endless. Native and introduced grasses mingle throughout the monument. Birds scan the fields looking for rodents and/or insects. 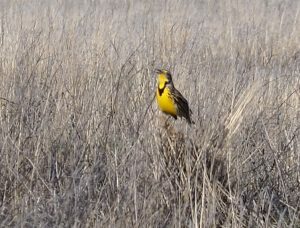 The nine-inch western meadowlarks in their bright yellow vests offer up a musical lilt from their perches on plants. They eat anything from snails to sowbugs to seeds. 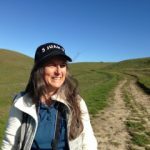 A northern harrier is flying low over the plains preying on small birds and marsh animals while we walk along the banks of Soda Lake. Many animals in Carrizo Plain are nocturnal. So despite our attempt to catch sight of the kangaroo rat one evening after dark, they never come out to engage in their regular feeding habits of chewing on bushes, sometimes to the nub. It might just be too cold. In fact, we joke how they are much smarter than we are. They have the foresight to stay in their warm dens while we are traipsing around in freezing weather desperately hugging our jackets tight. 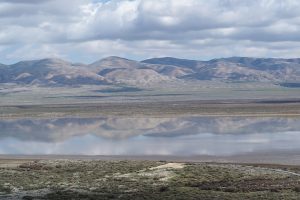 Carrizo Plain is known for the fact that the San Andreas fault runs right through its heart extending both north and south for about 800 miles total. In response to earthquakes and other movements, it causes ponds to arise, and rivers and creeks to shift, become beheaded or start new channels. It produces earthquakes because the tectonic plates it sits between rub against each other in their gradual movement north. The monument pays tribute to the Chumash people who have lived here for thousands of years, according to Pilulaw Khus, a California Chumash woman. 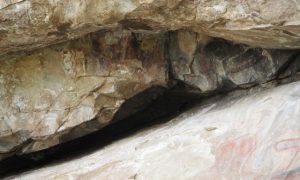 Painted Rock is still used by Chumash for sacred ceremonies. We feel fortunate to see even the remnant paintings of those who came before and those who are protecting their heritage today despite the assaults and decimation they survived when colonists invaded. I believe Painted Rock represents more than artistic expression. It also stands as a “written” record of some elements of the life of a strong tribe.